If you’ve started using Landsat after our five simple steps blog last week, or perhaps you’ve used its imagery for awhile, you may have come across, what we’ll call, quirks of Landsat. These may be things you didn’t understand, things that confused you or where you thought you’d done something wrong. This week we’re going to try to demystify some of the common quirks and questions with using Landsat data and imagery. Quirk One: What do the WRS path and row numbers mean? The Worldwide Reference System (WRS) is what Landsat uses to map its orbits around the world, and is defined by sequential path and row numbers. Despite its name, there are in fact two versions of the WRS; WRS-1 that’s used for Landsat’s 1-3, and WRS-2 for the rest of the missions. The paths are a series of vertical-ish tracks going from east to west, where Path 001 crosses the equator at 65.48 degrees west Longitude. In WRS-1, there are 251 tracks, whereas the instruments in Landsat 4 and beyond have a wider swath width and only require 233 tracks to cover the globe. Both WRS-1 and WRS-2 use the same 119 Rows, where Row 001 starts near the North Pole at Latitude 80 degrees, 1 minute and 12 seconds north , Row 60 coincides with the Equator at Latitude 0, and row 119 mirrors the start at Latitude 80 degrees, 1 minute and 12 seconds south. A combination of path and row numbers gives a unique reference within Landsat, the path number always comes first, followed by the row number. For example, 204-025 is the WRS-2 path and row for Plymouth. There are maps available of the paths and rows. However, there is also handy website from USGS that converts path and row numbers to Latitude and Longitude and vice versa; it’s accompanied by a map so you can tell you’ve got the area you want! This one can be confusing! On the GloVis image selector you have the option to specify the maximum percentage of cloud cover on your image. Selecting 50% means up to 50% of the image could be cloud, and selecting 0% means no cloud at all. Cloud cover is calculated using both the optical and thermal bands, and therefore as any Landsat imagery taken using the Multispectral Scanner System (MSS) does not include a thermal band, the cloud cover percentage is not easily calculated. Where a calculation does not occur the cloud cover percentage is set to -1%. At the bottom of the Scene Information Box, there is line for Sensor/Product. Although, the title changes it effectively displays similar information. If the sensor/product line includes TM, ETM+ or OLI-TIRS, meaning Thematic Mapper, Enhanced Thematic Mapper Plus or Operational Land Imager-Thermal InfraRed Sensor respectively, the cloud cover will usually be calculated as all these sensors have a thermal band. Whereas, if the sensor/product is MSS, then the cloud cover percentage will be -1%. Landsat 8 uses the OLI-TIRS sensor, Landsat 7 has the ETM+ sensor, whereas Landsat’s 4 & 5 have both TM and MSS sensors, and Landsat’s 1, 2 & 3 only have MSS. Quirk Three: What are all the other files alongside the LandsatLook Natural Colour Image? LandsatLook Thermal Image – This is usually a jpeg of the thermal band, which shows the variations in temperature, where the darker areas are colder, and the lighter areas are warmer. LandsatLook Quality Image – Currently only available with Landsat 8, and is a jpeg which shows the positions of the clouds and other features such as snow and ice on your image. LandsatLook Images with Geographic Reference – These are a series of compressed data files which can be uploaded into a Geographical Information System, allowing the application of image processing techniques. These are big files compressed, an even bigger uncompressed, and so you need a lot of storage space if you start downloading them! Quirk Four: Why do some Landsat 7 images have black stripes on them? South West England from the 8th December 2014, showing black stripes. Landsat 7 imagery courtesy of USGS/NASA. This is due to the failure of Landsat 7’s Scan Line Corrector on the 31st May 2003. The Scan Line Corrector’s role is to compensate for the forward movement of the satellite as it orbits, and the failure means instead of mapping in straight lines, a zigzag ground track is followed. This causes parts of the edge of the image not to be mapped; hence giving you the black stripe effect – it can be seen clearly to the right with a zoomed in version of the image at the top of the blog. The location of the black stripes varies, and each stripe represents between 390 – 450m of the image; therefore US Geological Survey (USGS) estimates that affected images lose about 22% of their data. 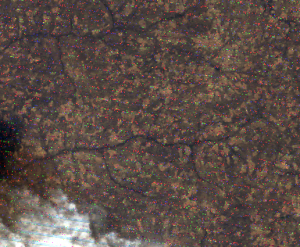 The centre of the image can still be used, however it’s more complicated to use Landsat 7 data after May 2003. It’s worth noting that on the sensor/product line in the Scene Information Box, it uses the notation SLC-off to indicate that the image was taken after the Scan Line Corrector failed. Landsat 5 MSS image acquired on 16 January 1997 via ESA receiving station. 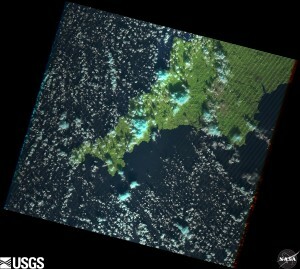 Image courtesy of USGS/NASA/ESA. Brightly coloured single pixels that don’t match the surrounding area, is phenomena known as Impulse Noise; which is also seen with dark or missing pixels. An example of an image with this phenomena is shown on the right. Technical issues during the downlink from the satellite or during the transcription from tape to digital media are the most frequent causes. However, small fires on the ground can also show up as bright pixels that cause the same effect, although these are less frequent. As Landsat has a 30m spatial resolution, these aren’t campfires or barbecues; but are high temperature features such as brush burning, wildfires or gas flares. Images heavily affected by Impulse Noise aren’t released into the USGS archive. Also it’s only visible when zoomed it, and selecting another image from a different date will mostly likely cure the phenomena. We hope this quintet of quirks has explained some of the queries and questions you might have about using Landsat data, and if you’ve not come across any of these yet this should give you a heads up for when you do come across them. Mastering Landsat Images in 5 Simple Steps! What do colours mean in satellite imagery? Why understanding spatial resolution is important? 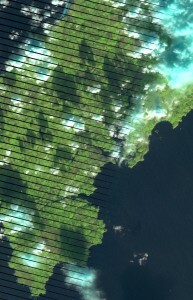 This entry was posted in Data, Earth Observation, Landsat, NASA, Remote Sensing, Space Can Help, Understanding Space, visualisation and tagged black striping, cloud cover, coloured pixels, Earth Observation, fire noise, impulse noise, Landsat, Landsat products, minus 1 percent cloud cover, NASA, path, pixalytics, Plymouth, remote sensing, row, scan line corrector failure, USGS, Worldwide Reference System, WRS by Andy. Bookmark the permalink. I was initially very confused when my downloaded LANDSAT 7 images had black stripes on them. This easy-to-understand blog succinctly explained why they were there! I have since replaced my downloaded LANDSAT 7 images with LANDSAT 8 instead. Thanks, glad you found the post useful. Why are Landsat images diagonal? Thanks for the question. It’s because the satellites orbit is diagonal. If a satellite’s orbit were a straight line, then it would never change latitude and so only image one strip of the Earth’s surface. To get round this, orbit’s are offset on a diagonal and so it changes as they pass around the Earth to give global coverage. You can see a simplified version of the Landsat satellite’s paths on this webpage: http://academic.emporia.edu/aberjame/remote/landsat/landsat_tech.htm.